Articles are generally more current publications than books, simply because the publication cycle for journals is a much shorter time frame than a book. Many articles are further developed by their authors into books and book chapters. CSUSM leases access to a wide variety of databases, so not all databases will be appropriate to your specific research topic. There is a drop-down menu on the Databases tab that will return a group of databases that have been identified as relevant to research in each discipline offered at CSUSM. There are various levels of content found in articles. Everything from op-ed essays to peer-reviewed scholarly studies. For help in identifying the scholarly from things your professor will not allow in your papers, this video illustrates some of the characteristics you need to see. The bibliography offered in a scholarly work will lead to other works on the same topic. Just keep in mind that the resources listed will be older than the article you are reading, so if you need the most recent studies, the bibliography will give you names of scholars writing on your topic who may have published more recent material, but not the most current research and writing. Indexes journals from 1970 on providing information about Central and South America, Mexico, the Caribbean and Hispanics in the United States. ALERT! Within ERIC search results: IF the "Link to ERIC full text" does not work, try the "Get It!" link. Dissertations and Theses Database includes digitized dissertations in a variety of subject areas including Art, Communications, Education, History, Linguistics, Literature, and Social Sciences. The different commercial providers present their search screens with different interfaces, but the basic strategies and features remain. Databases offer advanced search options and while some default to the advanced search screen, others provide a simple box to enter search terms. Advanced search is recommended to provide the most customizable search. Default search is normally on keywords, but searches can also be on titles, subjects, authors and much more. Databases may be citation only, citation and abstract, or full text. If the full text is not available in that database, the "Get It"
button will be visible. This button searches other databases to look for the full text of the article. When searching a database for articles, there are some key pieces of information on the record screen for the title you are interested in. Subject or descriptor tags will give you more search terms to discover new materials. We encourage the use of books in starting your research as the CSUSM collection is a hand-picked set of resources purchased for the courses taught in our university. This eliminates the problem of "too much stuff" as long as you strategize useful, relevant terms to type into the search box. You frequently do not need to read the entire book. A chapter in a scholarly work may offer the information you need without reading the rest of the contents. Use the index and Table of Contents to see what is there on your topic and concentrate on that section. The bibliography offered in a scholarly work leads to other books and articles on the same topic. Just keep in mind that the resources listed will be older than the book you are reading, so if you need the most recent studies, the bibliography will give you names of scholars on your topic, but not the most current research and writing. Being that you generally use a computer to search for books or articles, you need to strategize search terms to find what you need. The computer is only going to look for exactly what you type and nothing else, so this is your chance to be smarter than the machine! Using the example of 'child directed speech and motherese', here are terms that can return useful information in the library catalog. When searching the library catalog for books or media, there are some key pieces of information on the record screen for the title you are interested in. Full Text Available link denotes online access to an e-book. No library in the world can hold all information on a topic, although some do try! You can easily expand your search for books by searching the SD Circuit collection on your topic and requesting the material to be delivered to CSUSM for pickup (its free!) This takes 1-3 days normally. If you have a book title (from a bibliography or professor's recommendation), check our catalog, SD Circuit and then request through ILL if you have not found it. Please contact the librarian for help if things are not working the way you think or you want to find more than you have. APA stands for the American Psychological Association. It is the citation style used in most of the social sciences as well as some of the natural sciences. This is the official APA manual published by the American Psychological Association. It is the most recent and up-to-date edition available, currently the 6th edition. The CSUSM Library owns several copies of the official APA manual that you can consult in person. Click on the link above to see where they are located. Need access to the official APA guidelines right now but can't get to a copy of the book? Try out their website. It has helpful FAQs and basic guidelines. Produced by the APA. NOTE: HTML version of the tutorial works better. Examples accompanied by helpful screenshots and pictures showing you how to locate the information you need to include in your citation. 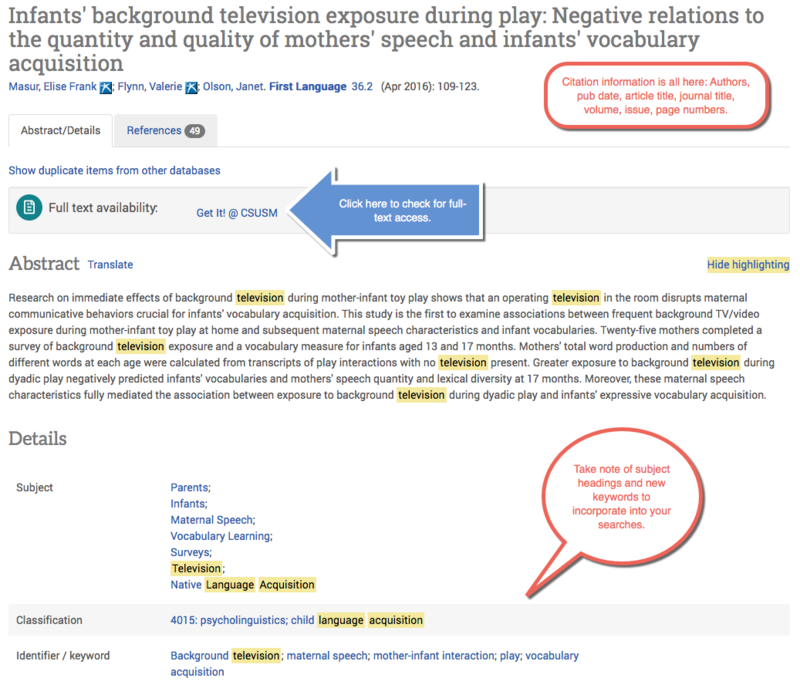 More examples of APA-style citations and paper formats from Purdue University's famous OWL website. Use the left-hand menu to find the category of item you are trying to cite. APA style requires that you include a Digital Object Identifier (DOI) whenever you cite the online version of an article. A DOI is a special number that identifies each unique article in a database. Please note- some articles may not have a DOI. A guide to the most common APA citation formats needed for business sources, compiled by the CSUSM Business Librarian and COBA faculty. Guidance on how to cite many different kinds of government documents in APA style. Examples for the most commonly cited federal and California legal documents. How do I make the § symbol in legal citations? See this guide by CSU Stanislaus librarians for how to insert the § symbol using Microsoft Word. If you are using an Apple computer, you can also insert the symbol by typing Option+6.